Epil-K9 provides the information below as a service to rescue organizations. We do not guarantee the health or the temperament of any dog listed below. We dedicate these pages to those who rescue and foster epileptic dogs, and to those who find it in their hearts to adopt them and give them a forever home. May there be a special place in heaven for people such as you. Pepper is a great companion and will share the joys of life with you. 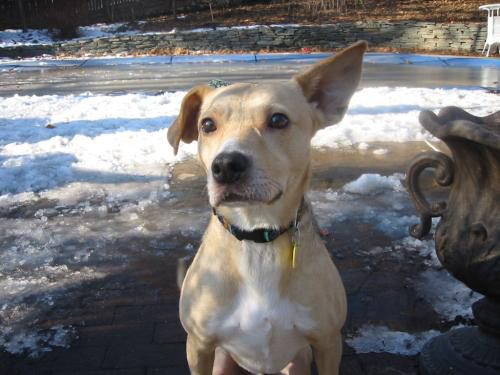 He has a heart of gold and is looking for a special family to take him home and cherish him. In return he will give all his love and devotion. Pepper is very playful and affectionate. He loves playing ball in the yard but would be happy just sitting near you when quiet time is needed. He loves giving kisses, but he's silly when he does - he is full of excitement and opens his mouth a bit so he accidentally kisses and bumps you. He loves to snuggle up and sleep with his foster mom!! Pepper is approx. 5 years old and best guess breed would be shepherd/terrier? Pepper weighs in at only about 30 pounds and is adorable. Pepper has been through two courses of obedience training and is very good with all of his basic commands (sit, stay, down). He is completely housebroken and crate trained. Pepper gets medication daily to suppress seizures (the meds are less then $10 a month) and he is doing great. He would do well in a household with or without children, sorry, no cats! He thinks a fenced in yard where he could play ball would be great! He is neutered, up to date on his shots, and ready for his fur-ever family!! If you can open up your heart & home to sweet Pep, please fill out an online application online WWW.EHRDOGS.ORG or email ehrvolunteer@yahoo.com.com for more information. He lives in Stanhope NJ.